Honda may be on the verge of producing the largest displacement Side-by-Side in the industry. While we cannot state for certain that anything is imminent, somebody in the know let it slip to ATV.com that a Pioneer 1100 is on the horizon. Also, Honda has a patent for a Pioneer with a third seat in the front row. We'd imagine these two things are related. I did not fly in from Liberia. I am a politician and am here to help. Believe what you will, but we (ATV.com) are expecting the Pioneer 1100. It's no guarantee, of course, but we like the pedigree of the source who provided the scoop. The Pioneer looks like a nice unit. It will be alot more versitle with an 1100 in it, if they put a low range in it. With the size of these UTVs coming out, both engine and physical dimensions, along with the price tag, when does it get to the point where you are just better off getting an SUV? The pioneer is a vehicle made to work, similar to the Yamaha and Poo Poo Rangers... I never liked the massiveness of big red or pioneer, they both look lumpy. Last edited by Oilcan; 10-17-2014 at 06:17 PM. This is dumb. Anyone that really loves Off-roading will tell you the same thing...the worst part of off-roading is riding passenger. These units are too powerful and to easy to drive...this puts people into the comfort zone of punching it and tearing things up. Big powerful units like this is why most of the states are pushing for a 50" or less width limits on recreational trails. Much like Colorado has already implemented and Arizona is trying to do. As for work what would you need on a project that a 680, or 500 for that matter, couldn't handle? I mean the new Rubicon 500 has a towing capacity of 1,322 lbs!!! If you are doing more then that you need to use a truck! If for nothing else for the brakes! Plus the Outlander 1000 I think is only rated for 1,300 lbs. My point here is that you don't need that much power. The shocks required for a smooth ride are the towing capacity limiter here not the power! Fact is, they build these things for the people out there that have to have the biggest "unit" around, if you know what I mean. I spend a great deal of time in the forest working and hunting. Much of the ridiculous and dangerous chit I have seen in the forest is by people with huge bore and extremely loud SxS. If you want to go fast. Go get a CBR or a CRF. At least that way you are only endangering yourself. If this huge SxS came with a lifetime supply of cookies; Cookie Monster himself WOULD buy it, then sell the SxS and keep the cookies. Cookie monster ain't no dummy or crazy. 42 HP sure, but the way the engine puts the power to the wheels is the trick here. You don't always need high HP. In regards to the 680/650 engines, if you use hydraulic pressures correctly, you have more power than you need, and Honda is All over that one! The big bore is a plus when you have four Good ole Boys riding in one of these up a hill. I would not get a SXS myself, thats what the Bronco is for(...and it holds 6), but everyone has their preferences, for their own reasons, good on them. 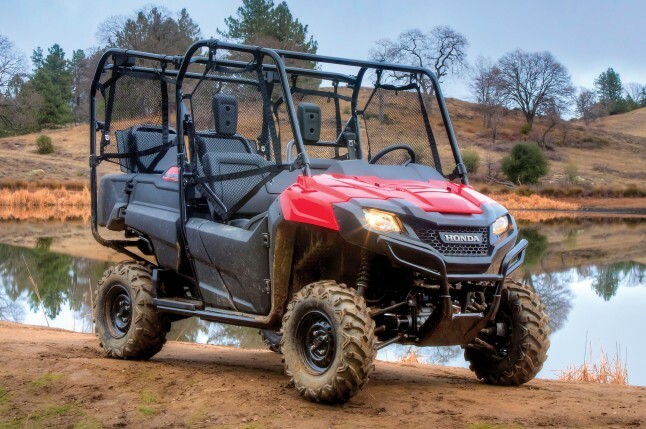 At least Honda and Yamaha are concetrating on the utility, people carrying aspect of the UTV segment and not the turn key dune buggy. I walked around a Pioneer in the showroom and was inpressed with the very apparent quality and detail that is used in building these. Maybe if Honda read some of the posts from these forums, they would be selling product and not going out of business(he says sarcastically).